Happy Holidays – Believers in Robots and Automation Rejoice! All of us here at Robotic Industries Association hope you enjoy a happy and prosperous holiday season! As 2010 comes to a close, we anticipate a much-improved year in 2011. Optimism is fueled by increases in robot orders (up 34% through three quarters), gains in RIA membership (up 10% for the year), and RIA has many new benefits to help your business thrive. Special regards to new members – 70 companies joined RIA this year, the most new members in several seasons. Hope we see you at the Forum and at Automate 2011! If you are interested in opportunities in warehousing, fuel cells, wind turbines or food processing we have market studies to help you determine business drivers. These are free to RIA members! Whatever your business, a good way to prepare for the New Year is to pre-register now for a free show badge to Automate 2011, March 21-24, McCormick Place in Chicago, Illinois, USA. This all-new show goes beyond robots, vision and motion control technology by emphasizing solutions. In fact, systems integrators are at the front of the show. Have you booked your space, yet? Remember, ProMat is collocated with Automate, giving the event a powerhouse combination of solution providers for material handling, warehousing, logistics, robots, motion and vision technology. If you want to build your career through specialized training, you can become a Certified Vision Professional from Automated Imaging Association and bone up on the fundamentals of flexible automation. 2011 has great significance. We mark 50 years of robotics since the first industrial robot was installed (a Unimate at General Motors). Milestones of the industry – past, present and future – will be highlighted at Automate 2011. For instance, a new robot safety standard is slated to go for vote and approval next year. It heralds a new age where worker-robot collaboration is safer and more convenient. RIA remains committed to helping its members find a brighter future. We aim to broaden our role as the primary resource for robotics information, to work more closely with system integrators, end users and schools with robotics programs (thank you RIA Educator Sponsors! ), and to making all of our events and activities more valuable for members. RIA and its sister trade groups, the Automated Imaging Association and Motion Control Association, represent more than 550 leading automation companies. More than 300 of the top executives from all our Associations will be at the Forum. As we look forward to 2011 and the new Automate Show, we know every member has great prospects ahead as automation becomes vital to the success of more and more companies around the globe. We look forward to helping our members as they take advantage of these opportunities. Winner of the 4th Robot of the Year Award in the small business in venture capital category (from the Ministry of Economy, Trade and Industry & The Japan Machinery Federation) is Mayekawa Electric’s ham boneing robot. Food processing robots are bound to attract a lot of attention as they naturally feed some people’s paranoia about robots taking over the world one slice at a time. Except for avid hunters, how many of us have ever skinned and cut up a carcass? Many standards are in place to safeguard public safety when it comes to food. Is it so bad to have a robot that is cleaner, safer and more consistent in handling food while complying with stiff regulations to help with what at times is a wet, messy and smelly job? What Mayekawa has done to robotize ham boning is part of a new wave of robotic systems that are ready now for installation and production. Congratulations to them for developing HAMDAS-R and overcoming very tough obstacles and the honor it took at the Japanese award event. The little boy was completely serious. 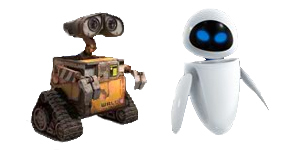 He really believed we might have a room of white, flitting robots just like the one named “EVE” in Disney’s WALL-E movie. Questions like this are not unusual when we take students on tours of the showroom at industrial robot integrator RobotWorx. For many kids (and adults) coming to terms with what a real industrial robot looks like and how it works requires some mental gymnastics. The fictions of Ironman and Transformers are easier to comprehend than the practical reality of a 6-axis manipulator. RobotWorx president Keith Wanner has always felt an obligation to mend this disconnect with industrial robots. He believes America’s youth need to be exposed to robotics. Not only is the field an exciting one in need of new recruits, robotics provides a unique learning opportunity – synthesizing multiple subject areas including mathematics, science, computer science, and electronics. And so, each year, in addition to giving tours of our facility to school groups and robot clubs, RobotWorx has found out-of-the-box ways to further robotics education. You could say our goal has been put the general public in touch with authentic robots without losing any of the “EVE” wonder. It has always proved a very rewarding experience. Here are some of the things we’ve done and the lessons we’ve learned along the way. One of the main things we’ve gleaned from the entire “giving back” process is your company doesn’t have to give millions of dollars to invest in the next generation. You can make an impact with small monetary contributions and other types of support. We’ve provided a number of robot clubs and other organizations across the country with modest donations that made a difference. Our most recent contribution went to a national robotics competition group, Botball. In addition, remember that as robotics companies we already have what it takes to be extremely valuable resources – we’re enthusiastic and knowledgeable about robots! Consider making your impact with some scheduled tours of your facility or school presentations. For example, Mr. Wanner has given a number of inspirational talks to area youth and local business groups. Look for ways to put robotic arms front and center. RobotWorx has had a lot of good experiences donating robotic equipment to various television shows and film productions. Our robotic arms have been featured in NBC’s Knight Rider, History Channel shows Sliced and Modern Marvels, as well as Paramount’s G.I. Joe: The Rise of the Cobra movie. Last year, RobotWorx donated an enclosed cart and two robotic arms, “Rivet” and “Bolt” to a science museum in Columbus, COSI. The robots are now an integral component of their robotics programming. The robots entertain and demonstrate their abilities by dancing and putting together puzzles. We were very pleased with the outcome. It’s important to seek out and support local robotics educational movements – clubs, competitions, STEM programs, etc. By contributing to organizations and efforts right in your neighborhood, you will be able to see your impact over time. We were honored to sponsor a new 4H robotics program, RoboKids, in our town of Marion, Ohio. The National Robotics Challenge is a robotics competition that takes place right down the street from RobotWorx every year. 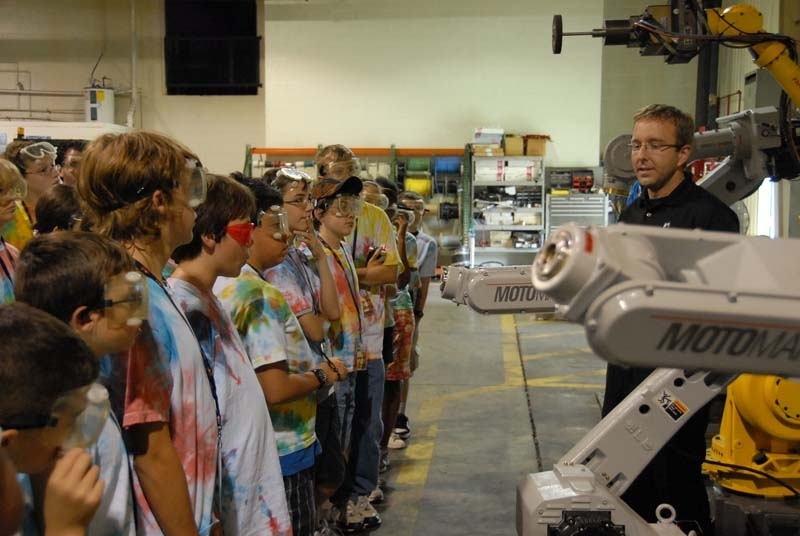 We host RobotWorx facility fieldtrips that include an “Introduction to Robots” slideshow and a tour. As you can see, there are many ways to promote robot education. RobotWorx’ involvement with robot education continues to prove extremely rewarding. It’s incredible to be able to share resources and knowledge with the next generation, a generation that is eager to learn anything and everything about robots. We’re very thankful for the opportunities we’ve had to give back and inspire others about industrial robotics. RobotWorx is an industrial robot integrator located in Marion, Ohio. For more information, visit http://www.robots.com or call 740-383-8383. You are currently browsing the Robots in America blog archives for December, 2010.